During the time of the judges, there was a brave man called Jephthah. Jephthah was the son of a prostitute. Jephthah grew up with his brothers who are from a different mother. One day, Jephthah’s brothers chased Jephthah out of their home because they say Jephthah is the son of a prostitute and so he is not fit to inherit anything from their father. Jephthah ran away from his home. He met a few idle men and they become a gang. Jephthah often raid the cities with his men. At that time, the Ammonites were fighting with the Israelites in war. The Israelites were about to be defeated when the elders of Gilead thought about Jephthah. So Jephthah sent messengers to the king of Ammon. The king of Ammon did not listen to what Jephthah said. Then the Spirit of the Lord filled Jephthah and he gathered a huge army from Gilead and Manasseh. Jephthah took his men and they fought against the Ammonites. The Lord delivered the Ammonites into the hands of Jephthah. When Jephthah came back to his house, his daughter is the first person who comes out of his house to greet him with dancing. Jephthah sent his daughter away. 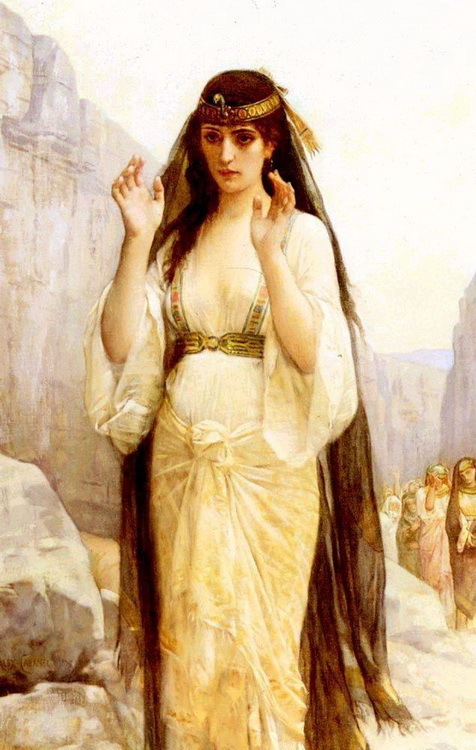 Jephthah’s daughter wandered in the desert for two months and wailed her virginity on the mountain because she will never be married. Thus the Israelites set a custom that the women will go out to lament for the daughter of Jephthah four days a year.